I know a lot of people are politically minded when it comes to buying from Wal-mart, whether it has to do with the lack of unions or the incredible cheap prices for products manufactured outside of North America. Nevertheless, quality has increased in recent years. One area where they have failed to increase in quality is fish and aquarium supplies in the pet supply section. The first major problem with buying your aquarium plants and supply from Wal-Mart is the lack of understanding by employees. To be honest though, it makes sense. Why on Earth should Wal-Mart employees know a thing about fish tanks and running an aquarium? Financially, it is not a section of the store that is cleaning up. Besides dog and cat food, pet supply is a pretty dead industry, just ask Petsmart and Pet Supply Co.
Employees do not know how to spot diseases, infections and dangerous bacteria. Often you will see incredibly damaged or dying plants, left to rot in the tank with perfectly normal fish and plants. The selection at Wal-Mart for live plants is really not that impressive anyways. You can occasionally find a wisteria or a water onion but that's about it. The other items are unidentified and likely not intended to be an aquatic plant but instead a terrarium plant. If you are taking the time to put live plants in your aquarium you would be better fit to include items you actually want, care to take care of, and have an interest in for your fish and tank ecosystem. I love my local shop, Tribly Tropicals. These guys are passionate about what they grow and what they know. They are dedicated long term to providing beautiful and high quality fish and accessories. Their live plants are expensive. But you know what? They stand behind them! They guarantee they will live if taken care of. They are free of disease, snails and rot. Besides, I would rather support the guys that are passionate about aquariums than a big corp. How much would I save if I shopped at Wal-Mart, probably $5-10 total. That is a one time cost! How often do I buy new plants? I replace plants rarely because they grow well and keep making new plants for me. I have an outdoor pond and occasionally start a new tank ever 2-3 years. That's not a big deal! Meijer is a high quality grocery store in the United States. They are known for having an excellent pet section. Within that pet section they have a nice variety of fish and fish tank equipment to choose from. What sets them apart from competitors though is their selection of live plants for sale. To save you some time and money, I have compiled a list of live plants commonly available at Meijer stores. This is not necessarily authoritative and will likely vary between two stores. Pennywort $5.49 - This plant is usually low growing in dwarf form and is often used in the background to hide heaters or filters. It can make a great center piece as the vines creep along the substrate and grow very fast. It does eventually produce beautiful white flowers. Filligree (myrio) $3.49 - I don't really know much about this one... Maybe you guys could help me out. Vallisneia Jungle $3.49 - This plant is a great cover for the background of a tank, ideal for covering a filter. It also has the possibility of producing flowers in time. String Fountain Plants $3.49 - This is a common catch all phrase used to describe a number of different species. These plants grow tall and thin. They are only ideal for tall tanks. Lloydiella $3.49 - This plant has fern-like branches and leaves. It is very compact, delicate and pretty. It is supposed to be one of the easiest to grow. Wisteria (assorted species) $3.49 - This plant is very full and pretty. 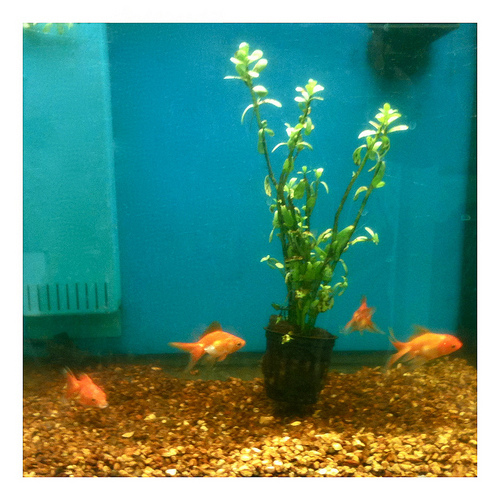 It is one of the most common plants purchased because it fits a variety of different tanks and demands very little. Aquariums with low light, bad nutrients and poor substrate will do fine with this plant. Rotala Indica $3.49 - This plant is uncommon for the species. The genus Rotala is very popular amongst fish tank hobbyists. Crypt Wendtii $5.49 - This plant is pretty but requires very strong light to grow well. You will likely have to buy better lights for your tank. Java Fern $5.49 - This plant is the signature plant for cherry shrimp collectors. A native to Southeast Asia it is very easy to grow and takes little to no maintenance. It perhaps planting in the foreground in groups. Amazon Sword $3.99 - This plant is often very fast growing and will become very tall very quickly. I would steer clear of this one if you do not have at least a 20 gallon tank. Water Sprite (spotted) $5.49 - This plant is very pretty but I know little about it. It is compact and looks to be easily transplanted to make new plants very easily. Dwarf Water Onion $2.99 - This plant looks like an onion does above ground but underwater. The bulb remains under the substrate while continually protruding to the surface. It is compact and skinny but will get very tall in time. All of the plants Meijer has are designed for a fresh water tank. Overall, Meijer employees take good care of their aquatic plants. All of them come in sturdy pot with aggressive root growth and green leaves and stems. Often times the plant you take home will have several growing on it, giving you more bang for your buck.